Winter hit us in a big way this week and now it’s time for snow removal. Many workers will be given this task with little or no training in the hazards of such operations. 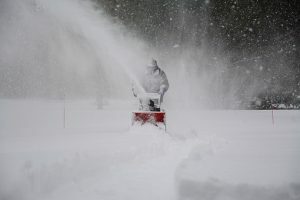 According to OSHA, many workers are seriously injured or killed while performing snow removal from rooftops and other building structures. Can snow be removed without workers going onto the roof? Are there any hazards on the surface to be cleaned that might become hidden by the snow? What are the maximum load limits of the roof and how do they compare to the total weight of the snow? What training will workers need to work safely? Use snow removal methods that do not involve going on roofs. Use ladders to apply de-icing materials. Use snow rakes or drag lines from the ground. Remove snow uniformly across the structure. Ensure that the ladder has level and secure footing. Position the base of the ladder a distance from the vertical wall equal to one-fourth the working length of the ladder. Clean snow from shoes or boots prior to mounting the ladder. Extend the ladder three feet above the upper level. Use proper form if lifting is required- back straight and lift with the legs. With these tips in mind, your business can survive winter by reducing worker injuries. For small businesses, OSHA offers a free On-site Consultation program that provides confidential advice. This program will help identify and correct job hazards as well as improve injury and illness programs. Visit http://www.osha.org to learn more.